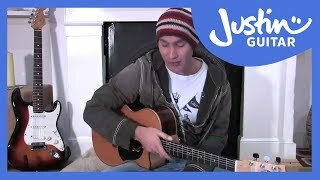 Now learn about Minor chords, they're no harder than Major ones at all, they just sound sadder! We'll be looking a bit more at timing and strumming and foot tapping, yeah I can help with that! 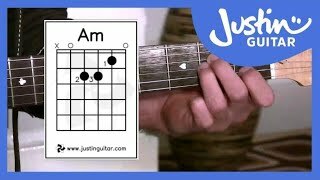 Learn how to play the Am Chord in this lesson. 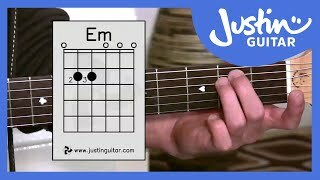 Learn how to play E Minor Chord in this lesson, the easiest chord we've learned on the course so far! 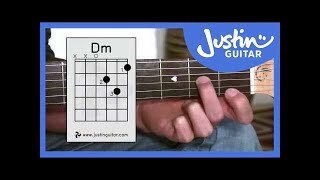 Learn how to play D Minor Chord on guitar in this lesson in the beginners course. The miracle One Minute Changes return and now we add in our Minor Chords! 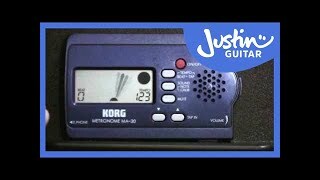 The Metronome is a musicians best friend, they will help you develop your rhythm which is essential, and for many, the hardest part of learning guitar! Seriously. I have a lesson on how to tap your foot. Sounds funny right, but loads of people mess it up so better get it right, no? 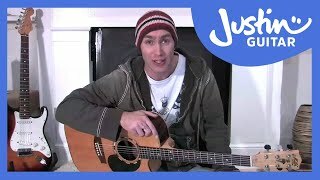 Easy songs for beginners that only use the chords we have learned in the course so far. 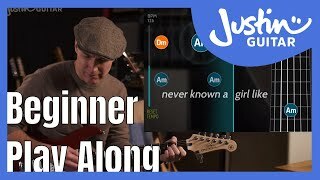 This song is a great minor chord workout and the play along makes it great fun! Just Use Sound To Improve Now will help you develop your ears - listening is a real important part of being a musician! What to practice and how long to practice for in Stage 2 of The Beginner Guitar Course.